Hello Your Next Stamp blogger friends!! 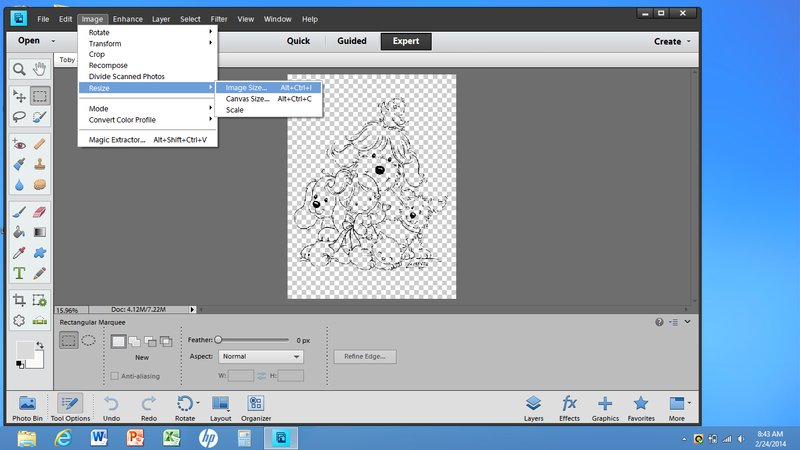 I wanted to share with you today some tricks on how to use your digi stamps on fabric. How fun is that? There are a few steps to take on this technique, but if you bear with me and perhaps grab a cup of tea or coffee, I promise you will have fun! There is also another medium that can be used to achieve this look, but I am going to show you how to print on fabric with your printer and Copic markers to color the image, using freezer paper and some Heat Bond iron on adhesive. So lets get started! The first step is to choose what image you would like to work with. 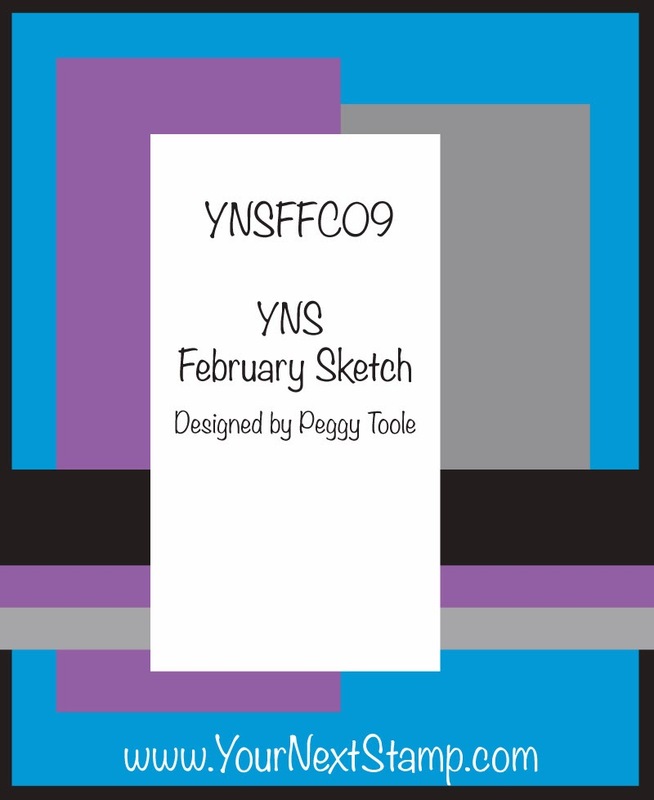 I know, that is the most difficult step because YNS has so many adorable images! ;) Once you have chosen the image, you will want to resize the image in your favorite photo editing program (I am using Photoshop Elements) to fit the project you are using this on. I am using Toby and Friends and as you can see here, I scaled it back 50%. 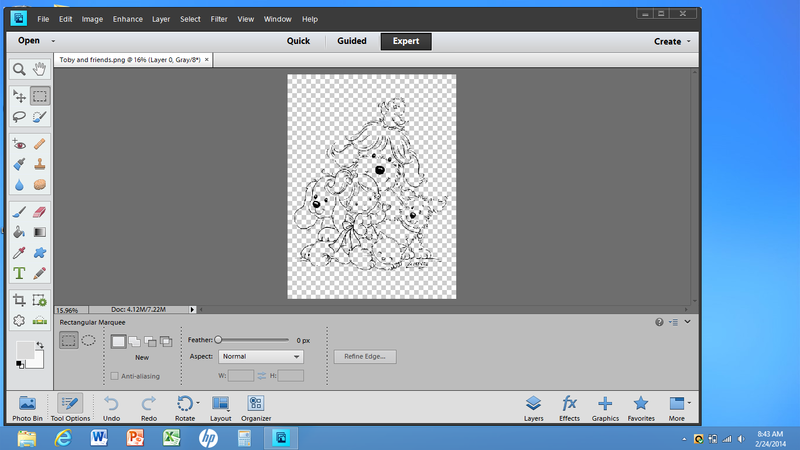 Once I have adjusted the size for my project, I went to the print screen to ensure I had it set to the area in which I wanted the image printed to. In this case, I wanted it in the middle. 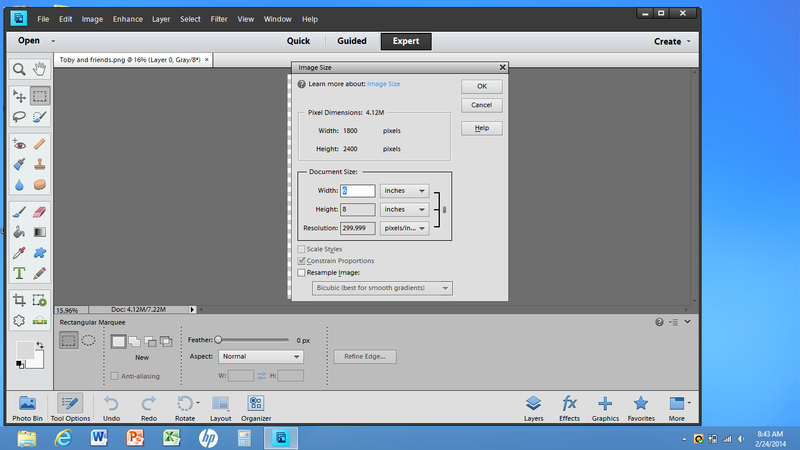 Allow me to show you the steps to prepare your fabric for the printing process. Cut your fabric to the size you want to print on. I cut mine to an 8"x8" square just to be sure I was covered. Then, cut your freezer paper just smaller than your selected size of fabric. Place the coated side of the paper to the underside of the fabric (the side you don't want printed on) and iron. Iron both sides to ensure a good marriage and no wrinkles on the fabric. Because I made my space an 8x8, I took my fabric and taped it to a sheet of printer paper so that I could feed it through, making sure the fabric was in the center. Depending on the size you are wanting to print, you could make the fabric and freezer paper 8 1/2" x 11" so that it would feed like a normal piece of paper. The choice is yours! Load your paper into the printer and hit print! I kept my printer settings normal and it worked perfectly. Fun, right? :) Peel away the freezer paper from the fabric. Cut a piece of the Heat Bond to the size you desire for the cut out. From this point, you can decide whether or not you want to run it though your die cut machine for a decorative look or just fussy cut like I did. Either way, be sure to have enough coverage area you will need to adhere it to your project. Place the shiny side of the Heat Bond to the underside of the fabric and iron on front and back until you get a good bond between the two. I fussy cut mine and then peeled back the paper from the Heat Bond leaving me the adhesive on the back. I ironed on the image to a small muslin bag and decorated the bag using some ribbon which I rouched through my sewing machine, some jute cording, and a button. I filled it with some dog treats and it is ready for giving to mans best friend! Thanks so much for taking a peek at my tutorial and hope you have fun doing your own fabric creation! Have a great week! 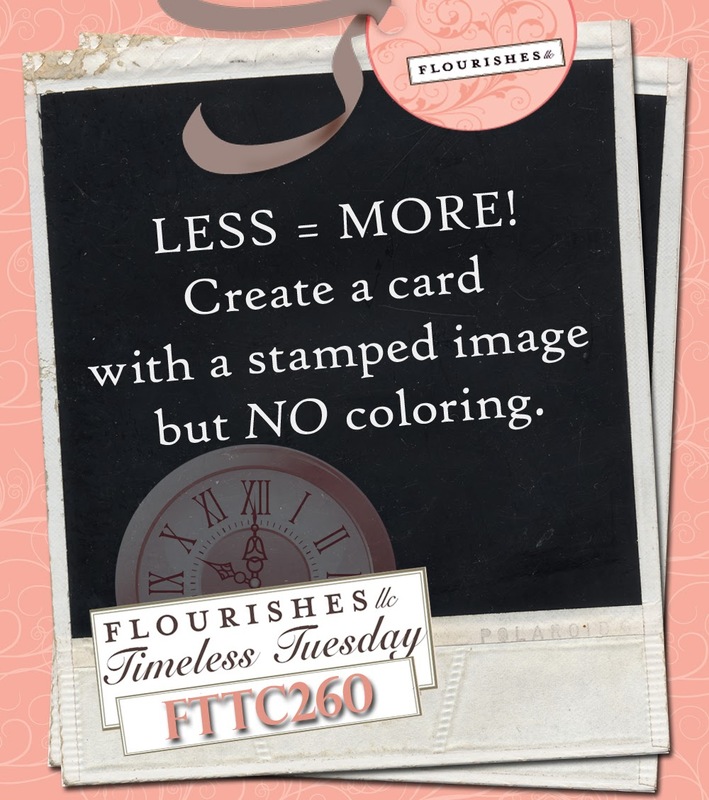 It is Tuesday and that means another Timeless Tuesday challenge! Woot! The ever so talented Cheryl is our hostess this week and it is a wonderful one! No coloring!! So many ideas you can do with this one, but for whatever reason, I was stuck on this idea I had for my card. I used Lots of Thoughts for the main image, starting with some kraft cardstock and some Flourishes classic cardstock in ivory and rounded the edges. I sponged in some clouds using a scallop punch out of scrap cardstock and some Memento inks. The image was stamped on kraft cardstock with Memento espresso truffle and potters clay for the banner, and fussy cut out. I popped it up over the clouds and added more clouds cut with some dies and sponged with more Memento ink. I finished the card with some seam binding ribbon and a fun button I found in my stash. Thank you so much for taking the time to stop in and hope you all have a great Tuesday! 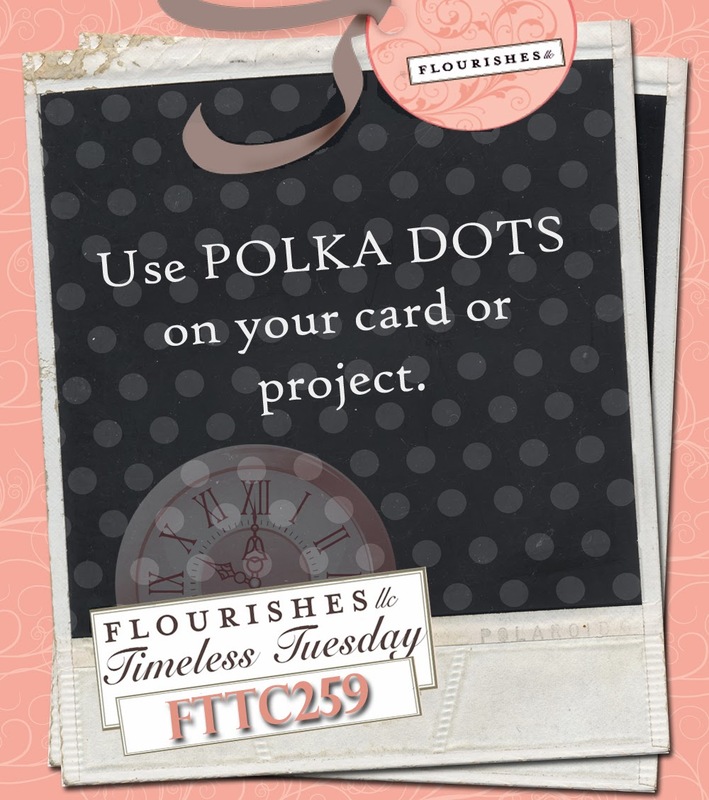 Don't forget to check out the other fabulous creations of the Timeless Tuesday team! Happy Friday to you and hope you are ready for a great weekend. Being Friday, that means it is time to share with you another creation for Your Next Stamp Friday Fun Project! For this card, I used Toby watering Roses for the image, paired with this month's challenge sketch. The image was printed on Neenah paper and colored in with Copics. The patterned paper is from MME with SU! cardstock in Regal Rose for the back panel on top of some heavy cardstock for the base. The image was then popped up finished with a few strips of cardstock for the bottom panel under the ruffled ribbon which I colored in with my Copics to match. I finished the card with a strip of Kaisercraft pearls for added texture. Thanks so much for stopping by and be sure to check out the other fun projects from the Your Next Stamp digi team! Welcome back friends to another fun and fabulous Timeless Tuesday Challenge!! I hope you all are having a good week so far, or for some of you, it's the start of the week. Hopefully, you have or had some good weather to enjoy during the long weekend. For this, I used the set Under the Big Top to create this scene of the cute bear riding along the banner with the big top behind her. (Pssttt... you can get this set at 50% off right now during the Gamblers Sale!!) I decided to color it with another medium that has been neglected - colored pencils. I whipped out those bad boys for a softer look and blended them in with a blending pencil rather than some Gamsol. I always enjoy the soft look pencils give and tend to forget that when I always reach for my Copics first. I started with some Flourishes Classic Cardstock in Ivory for the base while layering it with some Flourishes Classic Black cardstock and some patterned paper from Imaginisce. For the layout, I used the newest Deconstructed Sketch. The strips of solid cardstock are from my scrap stash. The images were stamped in Versafine Onyx, starting with the banner, followed by the bear, and finished with masking the bear and stamping the tent behind her. I colored in the tent, tutu, and banners with my colored pencils. The sentiment was stamped on a punched pinking circle from MS over the ball and popped up. The card was finished with some twine and the balloons cut out and popped up. That does it for me today! Thanks so much for stopping by and leaving a sweet comment. Be sure to check out the fabulous creations from the Timeless Tuesday Team! Hello everyone and Happy Presidents Day! As you all know, Jan Marie of Flourishes, will be stepping down as the owner to these beautiful and timeless products to take care of her health. Today I wanted to look back at some of these stamps and post a few of my favorite creations over the last year during my term with the Timeless Tuesday Team. If you are wanting some fabulous items from Flourishes, check out their Gamblers Sale going on now! Everything is 50% off! Still don't fret.... There just may be something new and fabulous in store in the future! These are just a handful, but throughout the week, I will post a few more to share in the success of these beautiful, timeless stamps over the course of Flourishes success. Thanks so much for stopping by and hope you have a wonderful day! Happy Wednesday friends and thanks for stopping by! I was able to play along in this weeks CAS Challenge at SCS using the Stair Step Sketch. Knowing I wanted to used Flourishes Under the Big Top set, I created this colorful card using a few of my Memento ink colors. 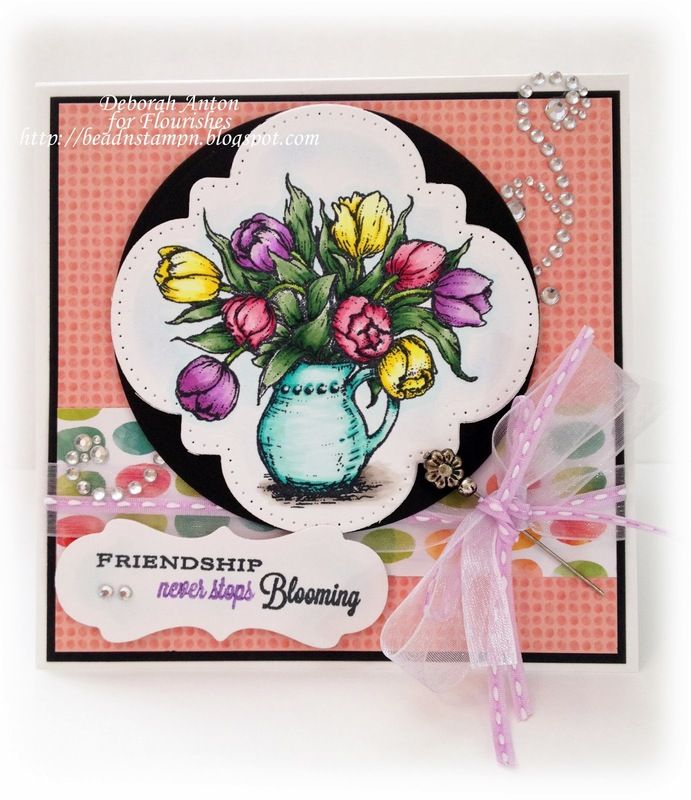 You can get this set, and others, right now at 40% off during the Flourishes Gamblers sale. Hurry before your favorites are gone! Using the ticket, I inked that up 4 different times using 4 different colors - Lilac Posies, Toffee Crunch, Teal, and Orange. I then stamped the elephant on another piece to fussy cut and paper piece the top of him to be popped up on the ticket. The balloons were also stamped, cut out, and popped up for a little extra fun. The card was finished with the sentiment stamped at the top. I love the colors of this card and how it turned out. Hopefully, this inspired you today to stamp in color and have fun! Thanks again for stopping in and have a wonderful Wednesday! It's Tuesday and of course that means another fabulous challenge with the Timeless Tuesday Team. This week, the super talented Katie is our hostess and she has a great challenge lined up for you. My mojo these last few days have been lost, but having my kids and husband sick probably didn't help! Those poor boys all had a bad chest cold leaving one of my son's with Croup. Everyone is finally on the road to recovery and I am able to get back to creating. I know I had a very CAS card last week and didn't plan on another this week, but it is where my creation ended up. The challenge Katie has put together is incorporating wood texture or a wood element into your card or creation. For my card, I used Just My Type for my main focal point inked up with some black Memento ink and some Memento ink in Love Letter. A quick side note... You can get this set right now during this weeks Gambler's Sale with everything 40% off! It makes me so sad to see this company end and I have enjoyed each and every day I spent on this team with some of the most amazing and talented ladies, but I do know Jan must take care of herself. If you haven't had a chance to read about it, you can here. I started with Flourishes Classic Cardstock (Sold out) in White for the base and using some red scrap for the panel. I then used some wooden buttons I had to line up along the bottom with the first button having some twine through it. The sentiment was popped up and the card finished with some rhinestones. Thank you for stopping by as you are all appreciated. Be sure to check out the other wood-erful (hee hee) designs from the Timeless Tuesday Team! This adorable image is called Little Posey which I paired up with Echo Park's collection of Sweet Girl. She is colored in with Copics and cut out with my nesties. I layered my papers before popping her up over the layers and finishing the card with a crochet flower, buttons, and twine. Be sure to play along with this month's new sketch and/or inspiration challenge for your chance to win!! More details on that here. Thanks so much for stopping by and I hope you all have a fantastic weekend! Welcome back to another Timeless Tuesday challenge blogger friends! It's Deborah here and I am happy to be your hostess this week with a challenge you are sure to feel the love! But first, have you checked out this weeks Gamblers Sale? You sure don't want to miss out on it because everything is 30% off!!! Head over to get those items you have been wanting before it's gone. So, lets talk challenge here... 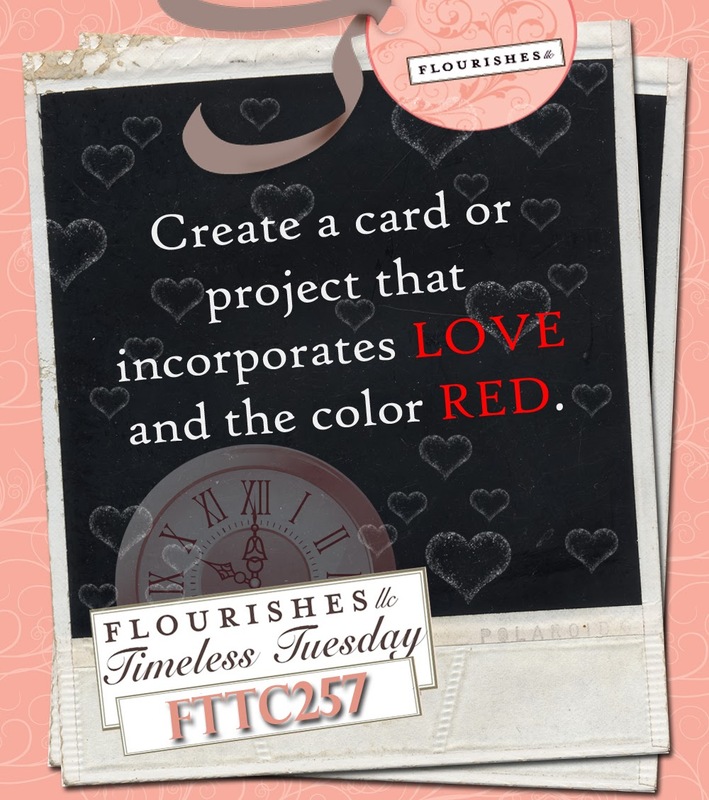 I am challenging you to create a card or project that incorporates love and the color red. How's that to get your Valentine mojo going? Get creative and show us the love! I went very CAS this week to showcase this image from Kids Play. I thought it would be sweet to take this image and make it as if she were blowing hearts instead of a dandelion. The hearts were drawn in after I stamped the image with some Versamark and then some Versafine ink in black and then adding some detail black embossing powder. I then heated it with my heat gun. Before adhering that panel to the red, I scored the top and bottom of the white panel for an extra element. The hearts were colored in and some Sakura clear glitter pen was added to that. The sentiment was from the new release of Wild Roses﻿ stamped with Memento ink in Rhubarb red. The card was finished with some red seam binding ribbon and a paper rose. Thanks for stopping by and be sure to check out the love from the rest of the Timeless Tuesday team!